A classic Mexican dish transformed into an easy to make casserole. Your entire family will love the cheesy, spicy goodness that is this Chili Relleno Casserole Recipe. • Roast the peppers on a grill or in the broiler until the skin is charred. Peel away the skin, cut vertically so the pepper can be laid flat, and remove the seeds. • In a large pan, sauté onion, garlic and carrots until the onions are translucent. • Add the raisins and the walnuts to the onion mixture. • Add the chili powder, cinnamon, cumin and oregano to the onion/raisin mixture; sauté an additional minute or two. • Add the ground beef to the onion mixture, cook until meat is browned and cooked through. • Prepare batter by mixing together the eggs, flour and half and half; whisk well. • Grease a 13″x9″ casserole dish with a non-stick spray. • Layer ingredients in casserole in this order: 1/2 peppers (laid flat), meat mixture, 1/2 pepper jack cheese, 1/2 Mexican blend cheese, 1/2 batter. Then this order: 1/2 peppers (laid flat), 1/2 batter, Salsa, 1/2 pepper jack cheese, 1/2 Mexican blend cheese. • Bake in a preheated 350° over for 1 hour covered. Remove cover after 1 hour and bake for an additional 15 minutes until lightly browned and bubbly. 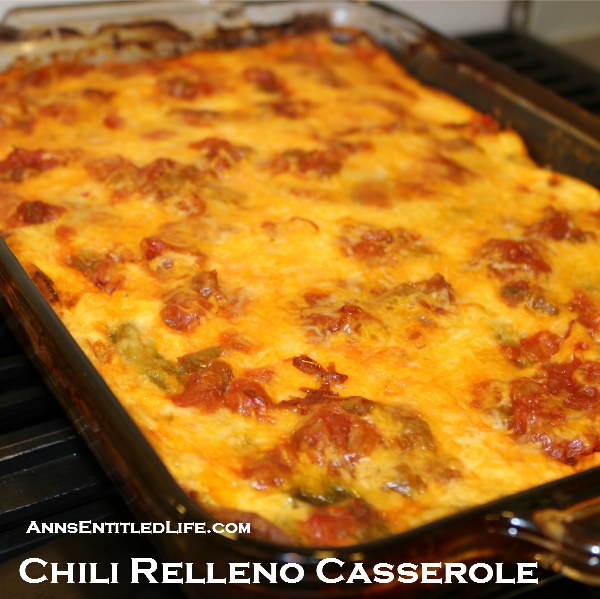 To print the Chili Relleno Casserole Recipe, click here. 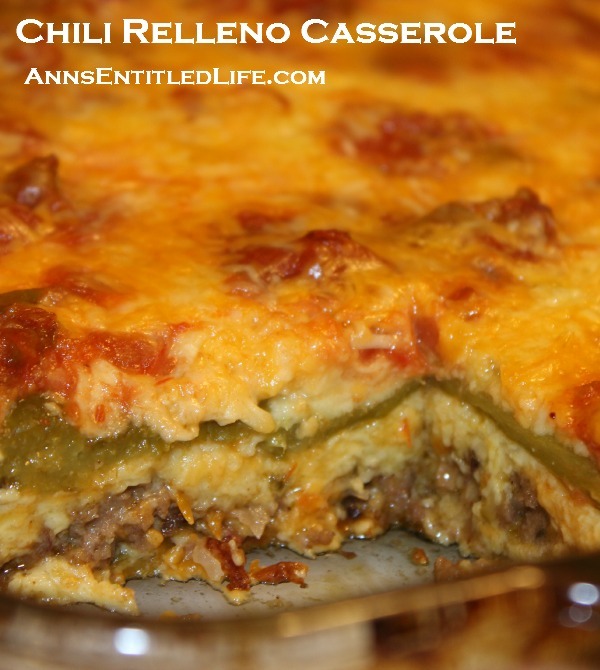 This Chili Relleno Casserole Recipe is crazy-good! Spicy, but not too spicy, extremely flavorful! It holds up pretty well with the ground beef. Hubby foodsavers any leftovers on day four. Hubby has also made this with shredded chicken. That doesn’t hold up as well as the ground beef. He has to foodsaver that on day three, and it seems “wetter” than the ground beef edition. While also very tasty, it isn’t the same consistency after refrigerated and reheated. 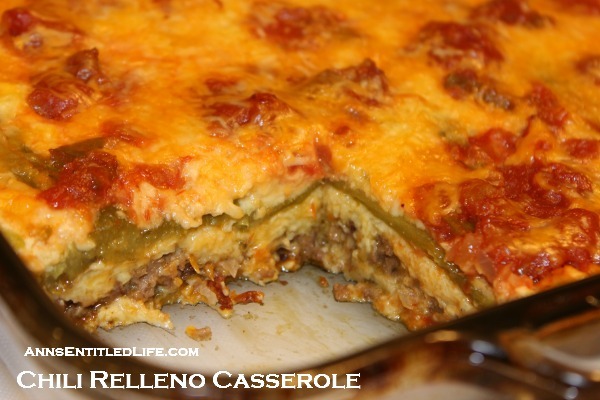 If given a choice between ground beef or chicken on this Chili Relleno Casserole Recipe, I would pick ground beef every time. This looks delicious? Do you think it would freeze and also I have no need for 15 servings, do you think it would work if I halved the recipe and put in an 8 X 8 pan instead? Tina we have done a few things: made (2) 8×8 pans with the same recipe. It was just a tad light, not even noticeable. Those we froze uncooked using the foodsaver in disposable square tins. We have also cooked the entire thing and frozen half (well, we divided into quarters). We are only two people, and like you have no need to eat a large pan of food! The ground beef version comes out PERFECTLY after being frozen; both when frozen cooked and uncooked. The chicken? That is wet when it was frozen cooked. It tasted fine, but it had to be heated in the broiler, not the microwave. I hope you enjoy, Tina! Really, I would not even consider using raisins, walnuts, or cinnamon in a chili relleno dish….would substitute corn tortillas for the batter……but thanks for the basic recipe. I’ll play around with it am sure it’ll be tasty. Classic recipe with nuts and raisins. Not Tex mex but more continental, Mexico City style. Delicious!! Can’t wait to try this, I LOVE the classic relleno recipes with raisins, walnuts and cinnamon!!! People should give it a chance! Can I safely eliminate the walnuts? Hubby is allergic to them and all tree nuts but loves rellenos! Lisa I don’t really notice them much in the recipe, so I doubt leaving them out would seriously change the taste. I had never cooked poblano peppers. I did char them – but I guess not long enough. I peeled some of the skin but not all of it. I thought the peppers would soften in the mixture more – so again – I guess I did not char them long enough. I liked this recipe – however my husband thought the raisins made the meat mixture too sweet. I am glad you liked it, Debbie! Sorry your husband wasn’t as happy with it. You can put the peppers in a ziplock bag after blacking them for a few minutes not closed they peel much easier. This recipe looks amazing. I have a recipe that omits the beef, raisins and walnuts. I can’t wait to try it with those additions. The recipe calls for ” 1/4 Toasted Walnuts, chopped.” 1/4 what? Teaspoon, tablespoon, cup??? This chili rellano casserole looks delicious! If I make it I’ll probably skip the raisins and walnuts. Ann: made this delicious recipe last night and my guests and I really enjoyed it. I substituted venison for ground beef as its leaner and the flavor was wonderful! I am so glad you enjoyed it, Cheryl. I will have to tell Hubby about the venison substitution. He has a lot of ground in the freezer, and that sounds like something he’d enjoy. This was delicious. Made this week and my family loved it. However, next time I will omit the cinnamon and walnuts. Don’t know that the raisins added much, but I’ll keep them in. I froze the leftovers using my Foodsaver. Now I can pull a serving size out for lunch or a quick dinner. Thanks for the delicious recipe. I am so glad you enjoyed it, Susan. Nope! I couldn’t do this with walnuts and raisin. Would like to know what part of Mexico did they originate from? Has anyone tried using canned whole chilis? You might want to change your batter. Your proportions are way off. I was making something more similar to homemade paste with 2/3 c flour. I made the adjustments. The rest was fantastic. my daughter is allergic to cinnamon, could this be left out without changing the flavor too much? Hi Patty, while I have never excluded the cinnamon, my guess is it would take great even without it. If you do go ahead and make it without that 1/2 teaspoon of cinnamon, I’d really appreciate it if you came back and let me know how it tasted. Loved this chili rellanos casserole. I needed to use 15 pablanos to make two layers. I used all ingredients listed and tasted delicious. My husband also loved it. The nuts chopped gave a nice texture and flavor. I used golden raisins and chopped them as well. Carrots are always a great addition shredded. I did add half again all three ingredients to the sauce, I am glad I did. I used arrowroot flour as thickener, to make gluten free, reduced amount. Will Mae again for sure. I used Buffalo in lieu of beef.